I’ve been making this recipe since before I could walk believe it or not. From a toddler and beyond, I have always been a baking fiend. My mom used to have my two older sisters and I help her in the kitchen when she baked us delicious things and treats. 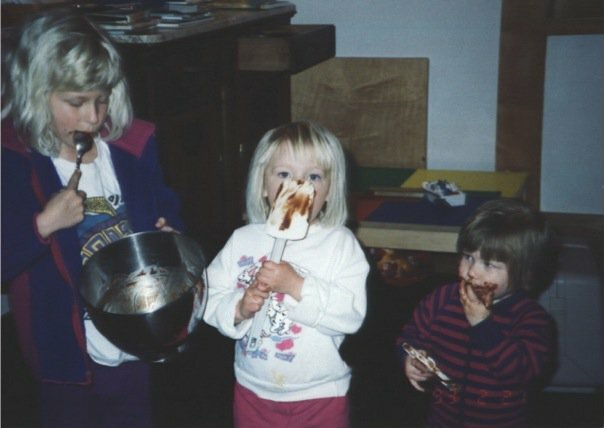 There’s a whole collection of old photos of the three of us holding the stand mixer bowl, paddle and spatulas with our faces covered in batter and/or dough. Pretty classic. 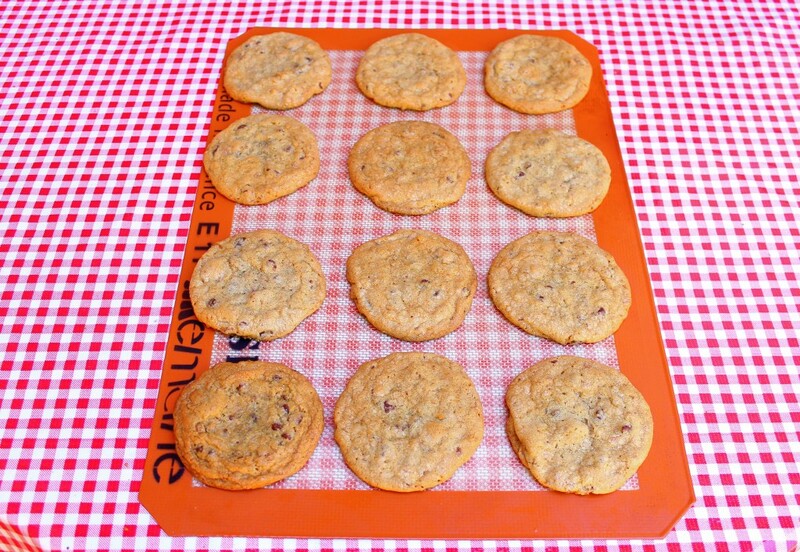 We would usually do the tasks like scooping out cookie dough onto baking sheets (while also nomming on the dough of course) or separating out our secret ingredient, the bran, from the raisins (yuck). She’d have us measure out the brown sugar, and that was always my favorite part…squishing it into the measuring cup as hard as my little hands could. 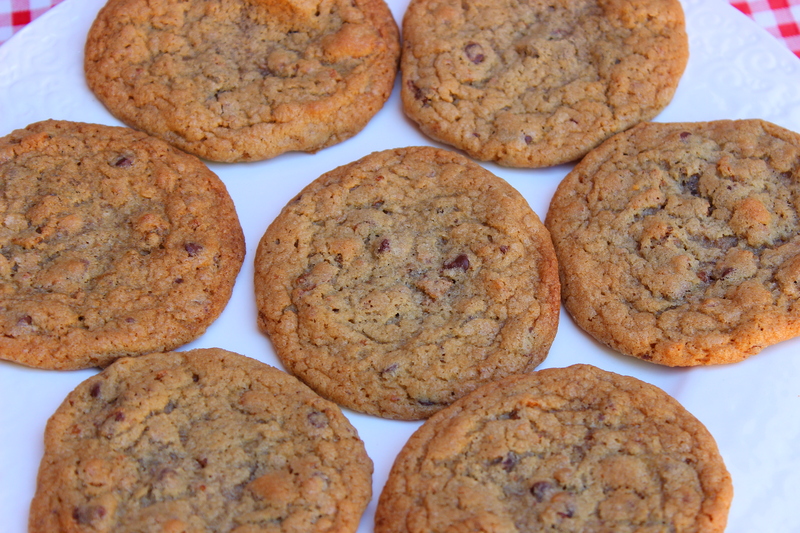 This cookie recipe, though simple and classic, is one of the only baked goods that is truly comforting to me. It is one of two traditional American things my mom would make at home when we were all growing up. The other is our fave brownie recipe. 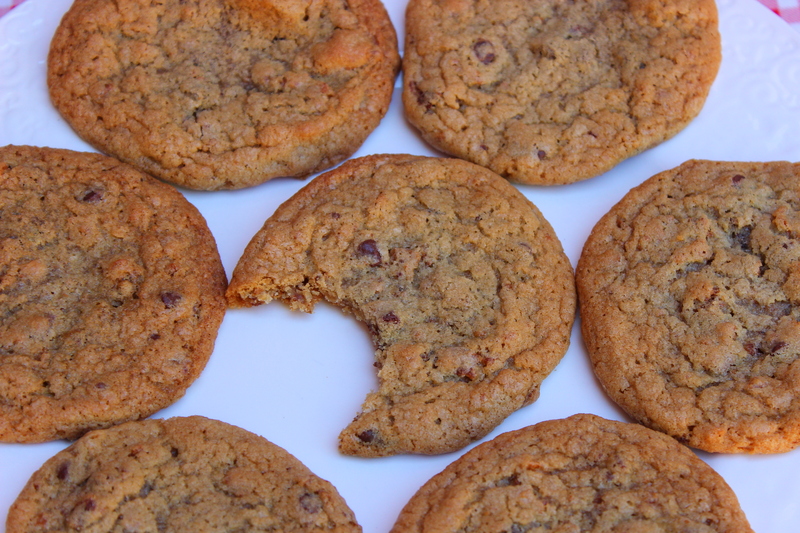 Whenever I’m craving just a nice chewy chocolate chip cookie, I still go back to this recipe. 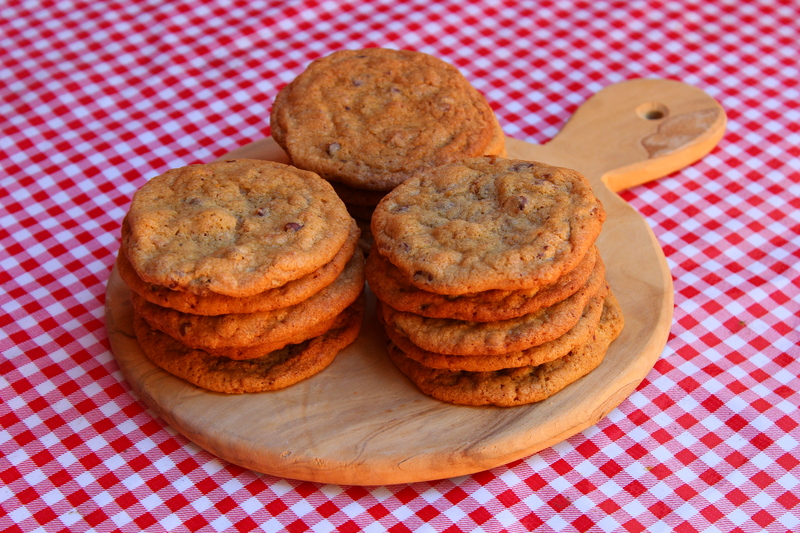 The bran from the raisin bran gives this classic cookie just a little more oomph and a wonderful textural component that is missing in most ccc recipes. These guys are actually kind of famous among family friends. Many people in our friend group have tried them and rave about how yummy they are. They always ask what we do to them to get them so chewy… It’s the bran man! I’m a flat/chewy cookie person (notso into the fluffy/cake-like ccc’s), so these are perfect for me. 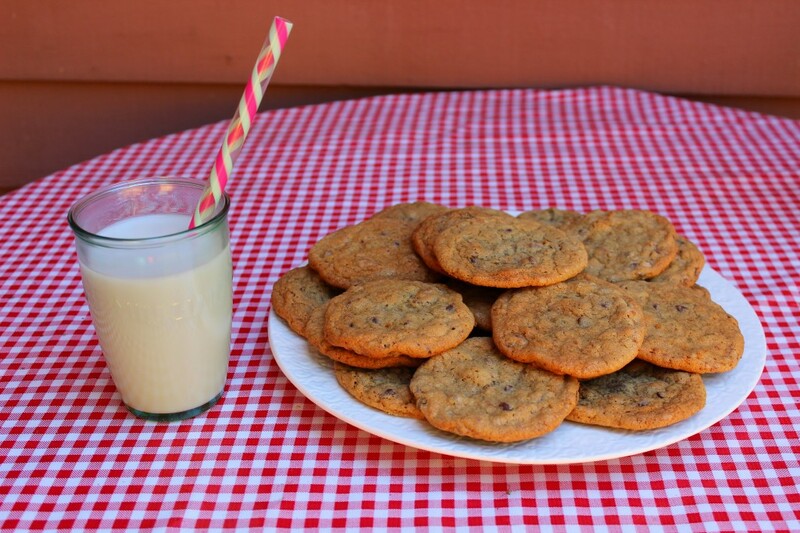 My fam's go-to chocolate chip cookie recipe. A classic amped up with great texture from bran flakes. Preheat the oven to 375 degrees. Line a baking sheet with parchment or a silpat. In the bowl of your stand mixer, beat the shortening or butter and sugars together on medium until light and fluffy. Add the eggs and vanilla and beat until incorporated. Next add in the salt and baking soda. Once mixed, pour in the flour and mix on low until it just comes together. Mix in the bran flakes and chocolate chips by hand with a spatula. Using a medium cookie scoop, portion out the dough on to your baking sheet. Bake for 10-12 minutes until browned on the edges but still somewhat soft in the middle. Cool on a wire rack. I’ve made these cookies probably hundreds of times. The recipe is ingrained in my mind forever. I could be having a completely terrible day, and the smell of these cookies in the oven would bring me right back to my childhood home and baking with my momma. Instant happiness. 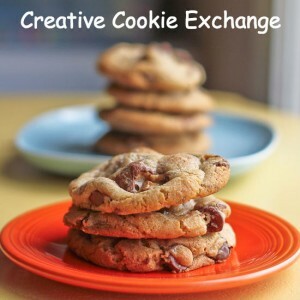 The Creative Cookie Exchange theme this month is Comfort Food Cookies! 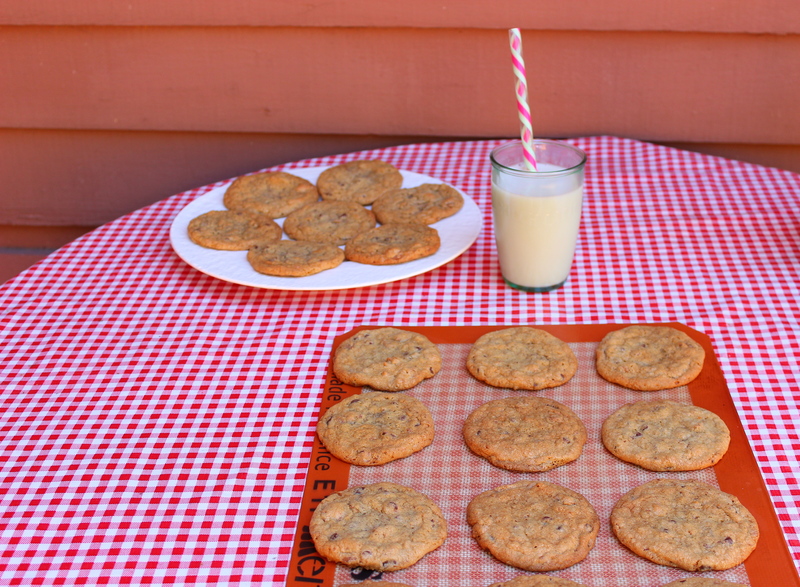 What cookie says comfort food to you? 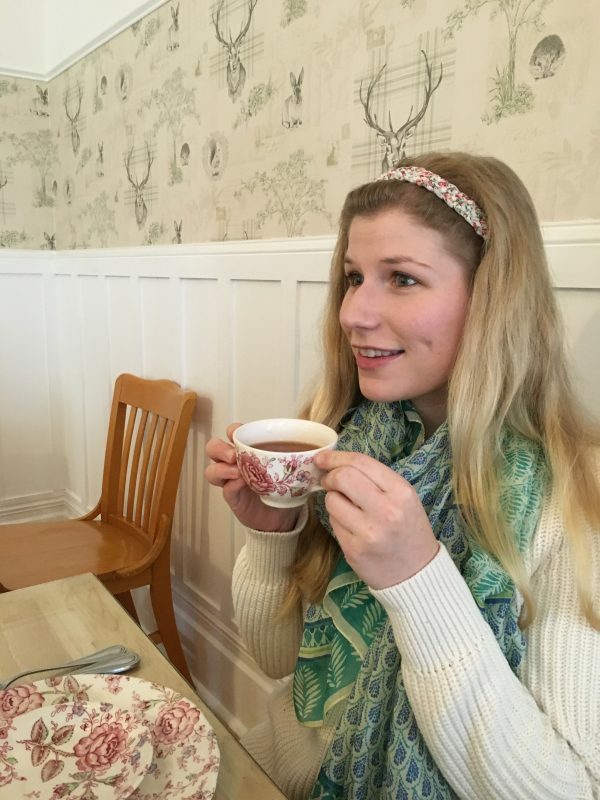 If you are a blogger and want to join in the fun, contact Laura at thespicedlife AT gmail DOT com and she will get you added to our Facebook group, where we discuss our cookies and share links. That photo of you and your sisters is adorable!!! What great memories to go along with these cookies. Thank you Becca! That’s a great idea, I’ll definitely have to try it! I made cookies a while back with raisin bran too and had forgotten all about them. I’ll have to give your recipe a try. Looks great! I would totally pick the raisins out of Raisin Bran for these, Sophie! They look wonderfully chewy. I have photos of my girls in the kitchen looking just like you and your sisters. Precious! I love how far back this recipe goes for you–great choice. I wonder who originally had the idea to use Raisin Bran while removing the raisins lol? 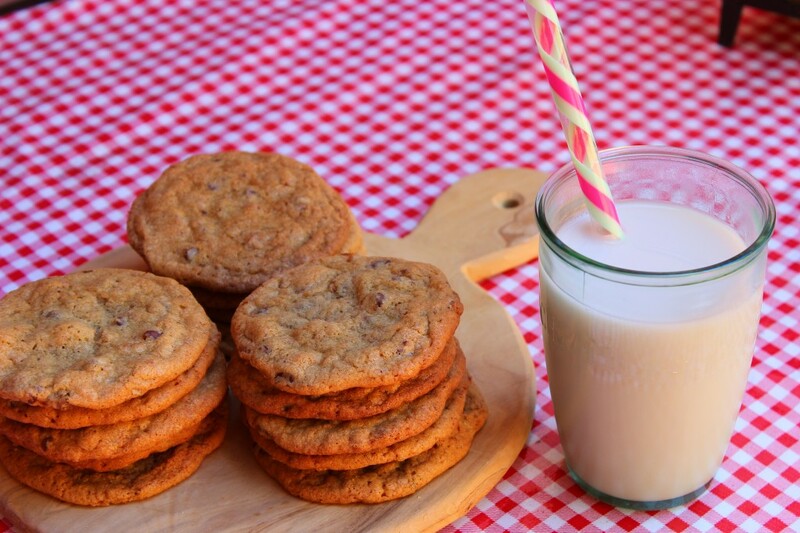 I love cereal in cookies so I bet these are fantastic! Thank you Laura! I think it goes way back in my fam, I’m sure they got it from somewhere. What a precious Photo of your sisters and you. Adorable!! I see why you chose these cookies. So many fun and happy memories with them. 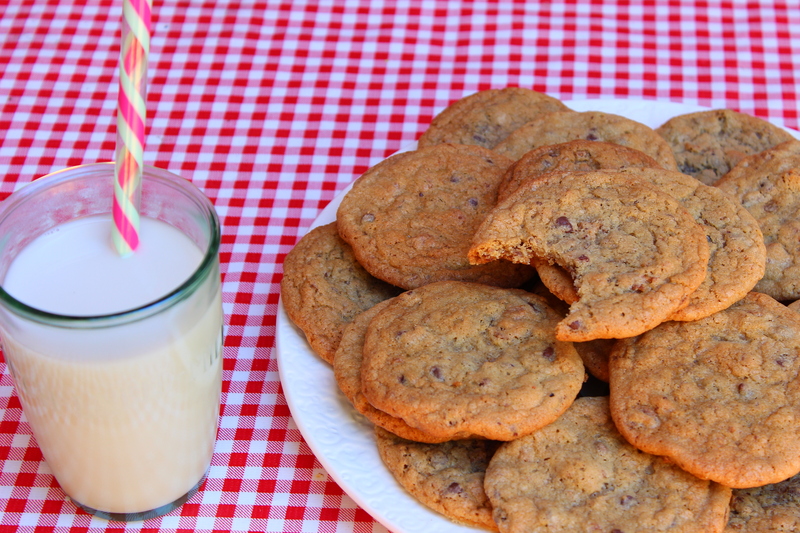 My favorite, chocolate chip Cookies…. So chewy, love the taste of Raisin Bran….Thanx for sharing…. Yum, these cookies look so delicious! They’d be the perfect afternoon snack! It really does! Thanks for stopping by Sarah! I really like the sound of your cookies and they look so pretty also. I’ll definitely give these a try. I love the photos!!! I could eat that whole plate of cookies, they look great!!! I can see how comforting these must be to you when they hold lovely memories. They look so good!